With historic castles, beautiful mountains of the highlands, sparkling seas, variety of wildlife, and a list of many such exciting things to do, Scotland is definitely a place that cannot be missed. The country of Scotland is a part of the United Kingdom and is bordered by England, North Sea, Atlantic Ocean, North Channel and Irish Sea. Edinburg, the second largest city of the country and one of the largest financial districts of Europe serves as the capital city of Scotland. Scotland functions in a devolved government and the executive branch of the Scottish Government is answerable to the Scottish parliament. The government of Scotland works on issues related to the life of Scottish people. The areas of their work include education, health services, transportation, justice, rural concerns and so on. The Scottish government was formed in 1999 after Scotland’s first elections ever. Topography wise Scotland is mainly hilly, especially in the countryside. But the highlands of the country, lying in the north-western side of Scotland are mountainous. Most of the areas in the south and east are plain and fertile. Scotland has long coastline of rugged and rocky beaches. The country has many islands, rivers, and a large number of inland lakes known as ‘lochs’. Scotland can be visited any time of the year. The peak tourist season commences from April and lasts till September. However, July and August are the most crowded months as it is the time of school holidays. So, it is important to book accommodation and flights in advance. Scotland has total seven cities including Edinburgh, the capital city, which is the second largest city of the country after Glasgow. These two are also the commercial centers of the country. Despite the compact size of the country, the scenic beauty of Scotland is immeasurable. The country is complete with everything for tourists like castles, lakes, and lovely countryside along with pubs, adventure sports, and much more. Amongst the many attractions of Scotland Outer Hebrides is renowned for its wild and remote islands. These isolated islands are beautiful with fascinating beaches, birds, and sports like kayaking and cycling. The Isle of Arran is another significant tourist spot with beautiful surroundings, beaches and pubs. Similarly, the Isle of Mull is also renowned, especially for its wildlife. There is a long list of many other attractions in the country. The most famous of them are Royal Deeside, Glen Affric, Speyside Whisky Distilleries, Mount Stuart, and Orkney among others. Scotland has its distinct culture, unique from the rest of two countries of the United Kingdom. The country celebrates festivities with great fanfare. Scottish people are fond of literature, music and art. The country organizes many music festivals that are popular throughout the United Kingdom. Christianity is the largest religion in Scotland. In addition, other religious groups like Judaism, Islam, Buddhism and other minorities also exists. 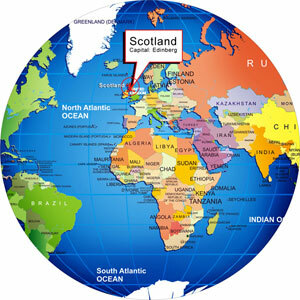 Languages spoken here are mainly English or Scottish English, Scots, and Scottish Gaelic. The economy of Scotland is open mixed economy and is chiefly dominated by heavy industries such as ship building, coal mining, and steel industries. The capital Edinburg is the trade and finance center of the country and it is the hub of many large financial firms. Scotland mainly exports whisky along with electronics. US, Netherlands, Germany, France and Spain are the major export partners of Scotland. Besides, tourism is also an important sector of Scottish economy.